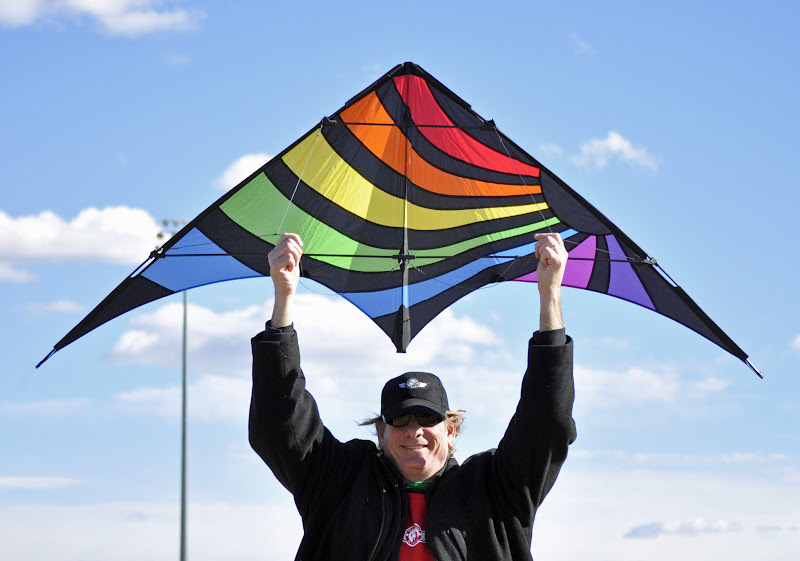 There are 3 sport kites in the Skydog fleet with an 86" wingspan. I have not flown the highest aspect ratio Sweet Emotion, but the other 2 (Dream On ($120) and Cross Fire ($140)) are competent performers with pretty good quality control and low price points. The Dream On sells for $20 less than the Cross Fire. You don't get the very clean nose design or the tail weights, but the kite is similar in size, shape and standoff position. 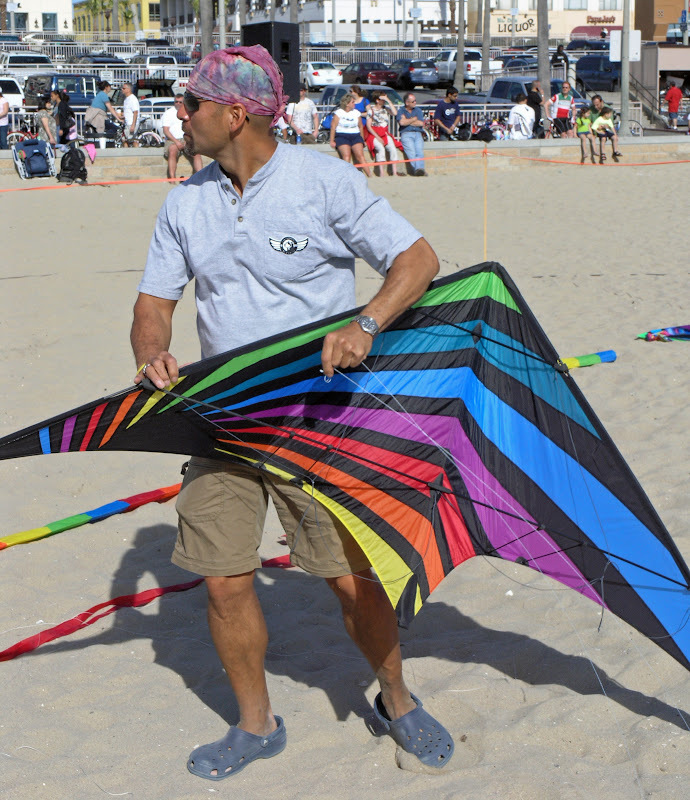 And if you like rainbow kites, you're in luck as this kite has 7 different shades across the spectrum with black interspersed. I flew the kite with all stock settings. Flight: The kite was totally silent at all wind speeds and even with aggressive tugs through the power zone. The kite was solid and quick with moderate pull. Corners were sharp with small inputs. Spin radius is tight. I prefer kites like that as spin stalls to tricks are fun. Just flying the kite was a kick. I thought the kite flew slightly better than the Cross Fire. Perhaps it was the lack of tail weights and the extra bridle line on the leading edge midway between the 2 normal positions which kept the LE from deforming under load. The bridle is on a short turbo leg setting. Tricks: There are no yoyo stoppers and the nose did snag a couple of times. But a simple scissor snip would take care of the nose snags. I mention the stoppers as the kite will yoyo fairly easily, even without weights. Of course, then I couldn't fly the kite as the lines slid along the LE down to near the wingtips. Cascades were very nice. Backspins, axels, flic-flacs, slot machines, straight forward although the balance of the kite felt a little off on the flic-flacs. 540s felt odd as did the JL type moves. I didn't try to add any weight, but I'm guessing maybe 5-10 gms would make the kite behave more like its weighted sibling, the Cross Fire. Construction: There are a few closeups showing sewing details. The nose does need a little pruning as it is not nearly as nice as the more expensive Cross Fire. When I spoke with Jim Cosca at KP7 about these kites, he was most excited about the Dream On and predicted it would be their big seller. I can see why. For the money, you get a fair amount of kite. One more thing. While I was getting the timing on the flic-flacs, I had a pretty solid lawn dart. Both lower spreaders came out of the center-T, the sail opened up to absorb the energy, and the kite sat there waiting for me. All I had to do was pop the LSs back into the T and start flying again. So you get some energy absorption built in as well. Nice job Dodd and Skydog. I'm looking forward to trying the higher aspect ratio Sweet Emotion. hey big brother - do you still have the pics in this review and can you link to them? Judging by the date this would have been Kite Party 7. John thanks for recording the evolution of the sail. Interesting to see the change in pattern. Thanks for making my next addition easy,love the look of it and i must have it on looks alone. Ive been dreaming about it and my dealer has it in stock and at that(same over here price) i can have it now and live the dream! I believe that second picture by John C. that Dodd is holding over his head is the "Lil Dreamer"... its a bit smaller than the Dream On and faster. The Dream On sail design hasn't changed, except they also offer it in White. David, how did you even find a post over 4 years old to reply too? Wow, you're eyes are amazing. I had to blow that up to full size to see it. Couldn't tell you about lawn darts. I was running around (walking actually). This kite is a great value. 6mm Carbon fiber frame, Descent construction, nice flying control over the kite and been able to perform tricks. The only thing i don't like to much is the sun-rainbow color design. I had a chance to try one a few months back. and had my camera with me so I Recorder it. I agree with you John. In flight, it behaved pretty much like you described it in your post. how come mine wont fly that good?